TerminalFour is a specialist digital marketing and web content management company used by some of the top universities and third level colleges around the world. Set up in 1997 by Dublin man, Piero Tintori while still in college, the business is headquartered on Amiens Street in Dublin and has offices in the UK, USA and Australia. Today the company employs 72 staff and has an annual turnover of more than €10m. "We work solely in the higher education sector where our software helps universities and colleges to maximise the effectiveness of their digital and content strategies," says Piero. "We help them create targeted marketing campaigns and clever engagement strategies to attract and retain the best students as well as utilising ecommerce techniques to drive activities such as alumni fundraising and research promotion," he adds. The company's software uses ecommerce techniques to recognise if a potential student is visiting a University website from a company, another country or another university. Knowing this, potential students will be presented with information and content relevant to their situation as opposed to generic content. For example, if a visitor who is working in a law firm accesses a law school website they will see promotions for continuous professional development courses as opposed to undergraduate studies. Similarly if a company executive who is a former student or alumni member is accessing a university's website then he or she will be presented with different images and messages about fundraising opportunities and events which they might like to support. "This personalised targeting of content is significantly more engaging for the user and much more effective for the colleges," says Piero. Their innovative approach so successful that the company currently has over 200 university and college clients in 13 countries with 60pc of their total revenues coming from US and Canadian, 25pc from the UK, 10pc from Ireland and the remaining 5pc from Australia and other regions. Among their growing list of clients are University College Dublin, the University of St Andrews in Scotland, Imperial College London and the University of Manchester in England, University of the Witwatersrand, South Africa, University of Wollongong and Southern Cross University, in Australia, Canterbury Christ Church University, in New Zealand and Columbia University and the University of Florida, in the US. "For example the University of Florida has annual revenues of more than $2bn and operates as many as 3,000 different websites promoting everything from individual courses and departments to sporting, recreational clubs and health and wellness activities," says Piero. "Our role is to manage the content and ensure standardisation of information and messaging across all their different digital and social channels." "We have become so expert in this niche sector that we were able to beat off global giants like Adobe and Oracle to win that contract," he adds. With the recent increase in the level of data breaches and ransomware, the company's exceptionally high level of security and protection against website hackers is a key differentiator for many clients. The fact that they can count among these, the Organisation for Economic Co-operation and Development (OECD) is a testament to the quality of their data security service. With revenues in the North American market forecast to double this year, the company recently opened a second US office, this time on the West Coast in San Diego, California. It's been an exciting journey for Piero who was born and raised in Dublin by his Irish mother and Italian father. Like many future entrepreneurs his aptitude for business was apparent from a young age, such as when he sold comic books to his friends to make extra pocket money. After school he studied Computer Applications at DCU. And it was here, in 1997, while he still in college that he set up TerminalFour. "We focused originally on building websites, infrastructure and systems for some really great companies such as Aer Lingus and Aviva, as well as a number of county councils, government departments and public sector organisations. "Having worked with Queen's College, Belfast and University College Cork, we saw the opportunity to help them not just manage their web infrastructure but improve the targeting and personalisation of their content through ecommerce techniques," says Piero. "By 2005 we had already begun building a solid client base of public sector, commercial businesses and universities, in the UK," he adds. In 2013 Piero undertook the Enterprise Ireland Leadership for Growth programme. 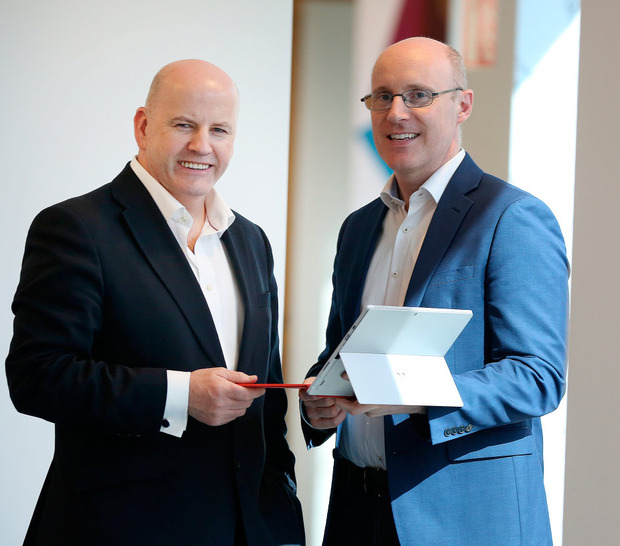 Supported by Enterprise Ireland, this world-class accelerator programme empowers CEOs to develop their leadership and strategic capability to lead highly innovative and internationally scalable businesses. "The programme was truly transformational for me and was also a turning point for the business and the catalyst for the new strategic direction for the company and the growth that followed," says Piero. "From then on we became laser-focused on universities and colleges as our target market, developed and launched a new modernised software product, began concentrating more heavily on building the right culture in the company and ramping up our sales effort - especially in the US. That's when the business really began to take off." For Piero, hiring really good people who are the right cultural fit for the organisation is of paramount importance. "I spend a lot of my time on this now because I believe that the best culture will attract the best people, who will create the best product and best results to our global customer base," he adds. With over 4,000 accredited higher education institutions in the US alone, Piero sees this market as offering the most potential for future growth. However, he also wants to expand his European footprint and has plans to open an office in Poland in 2018. To speed up the rate of growth in the business, he is also open to acquiring other companies that are a strategic fit with his. "It's an exciting sector and I am very proud of the impact we are having in helping students find both the right course and the right university for them - something that will have a major impact on the rest of their lives," he adds.